In 2012 it was estimated that about 165 million tons of plastic could be found in our oceans. We are adding to this number every year and with a growing population it’s time to look at plastic with new eyes and the urgency the health of our environments and planet Earth deserves. Imagine for a moment a garbage truck dumping its content on your front lawn. Not a pretty picture for sure. Now, just imagine one truck load of plastic waste being dumped in the ocean and then see another truck dumping its content, followed yet by another. Taking this picture into what’s happening in reality might be shocking: The current rate of plastic pollution ending up in our oceans are happening at the rate of one truck per minute, and its estimated that by 2030 it will be two trucks per minute and double that by 2050. Did you know that plastic production outpaced any other manufactured material in the past 6 decades? We make over 300 million tonnes of plastic today, by 2050, our population explodes to almost 10 billion people and we will be making triple that 300 million tonnes. Where is it going? 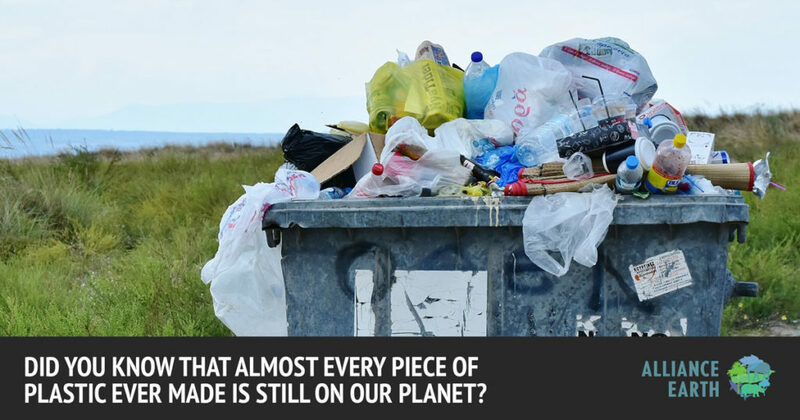 The problem is that only a fraction of that is recycled with the rest ending up in our environment. It’s an indestructible mass of plastic that at best can only break up, but not break down. You only have to take a quick look when driving around to see evidence of plastic pollution almost around every corner. Not only is plastic pollution appalling to look at, it’s causing harm to animals, fish and the only habitat we all currently share: Planet Earth. Plastic was made to last, and it became a popular and convenient material. However, it’s one thing to recognize the crisis around plastic waste, and another to take a moment to perhaps reshuffle the health of our planet as a higher priority than some convenience. At Alliance Earth we are supporting an educational art project called The Dung Beetle, which is an art education platform that will travel and show people how to turn plastic rubbish into usable fuels with lower emissions. The system plans will be given away freely, hoping to show and inspire others to create their own systems in their own communities. Plastic pollution reduction must happen quickly. It will require many different solutions, but humans are rather ingenious. Are you still adding to statistics on plastic pollution or have you started making changes to how you see plastic and manage waste? Take a moment today and re-evaluate the role of plastic in your life. It only takes one person to initiate a project that can lower plastic consumption and recycle plastic waste in a community. Are you that person? Start today with one single step: refuse to use one more plastic shopping bag. That’s a great start! You may just be the person in your community that initiates a change for the better. With the cumulative effect of individuals and communities addressing the plastic pollution crisis, changed statistics is inevitable – our planet is yearning for it! This entry was posted in Did you know? and tagged Dung Beetle, Green Energy, Innovative solutions, Jeff Barbee, Pierre Pretorius, Plastic pollution. How much plastic do you use?